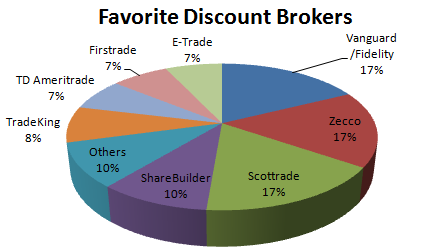 Early last month, I ran a poll here at this blog asking readers to name their favorite brokers. The purpose of that poll is to see what we ordinary investors are using when it comes to buy and sell stocks/ETFs and whether our choice coincide with experts’ opinion. When I search for a broker, my first question is always how much it is going to cost me to buy/sell a stock. Generally, the cheaper the better, though I don’t trade a lot and a few dollars more on commission doesn’t really make much difference. It’s just that “why go with an expensive option when I can use the cheaper one that does the same job: buy and sell a stock?” mindset. Of course, cheaper doesn’t always mean better (I know there are plenty of unhappy customers with Zecco which charges zero commission from my Zecco trading experience post). Anyway, when I closed the poll last week to make room for the IndyMac bank poll, 113 people voted in the favorite broker poll and to my surprise, Vanguard/Fidelity received the most votes of 20, followed by Zecco and Scottrade, both at 19. The result, that people made Vanguard/Fidelity their favorite broker, makes wonder whether I was clear in making Vanguard/Fidelity a choice. I wasn’t asking people’s opinion the two as mutual fund companies, but as stock brokers. 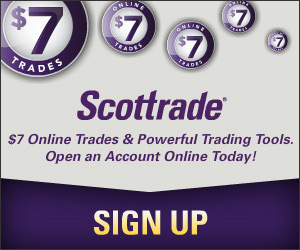 If I follow my own criteria, neither will become my choice of broker because they both charge much higher commissions. For Vanguard, the standard commission is $25 for buying/selling stocks/ETFs online, while at Fidelity, the standard fee is $19.95/trade. Not cheap at all. I use Vanguard for my IRA account and Fidelity is my 401(K) administrator (well, used to be), but I will definitely not use them as broker.